When the small town of Tenna, population 112, needed to restore their rickety old chair lift two years ago, city planners decided to go solar. Since the lift’s main station had a roof too small to accommodate the number of solar panels needed, a suspension bridge was designed to hold the panels above ground. The 50 yard system of wires holds 82 wings that rotate to follow the sun and can tilt to remove excess snow. The panels also offer skiers a heated seat for their ride up the slopes. Opened to the public only two months ago, the lift is expected to produce over 90,000 kilowatt hours of energy each year. On a sunny day, the lift already produces twice as much power as it consumes, making it an ideal green power plant during Tenna’s off seasons. "The panels also offer skiers a heated seat for their ride up the slopes.." Honestly I don't even see seats there.. only back support "hooks".. 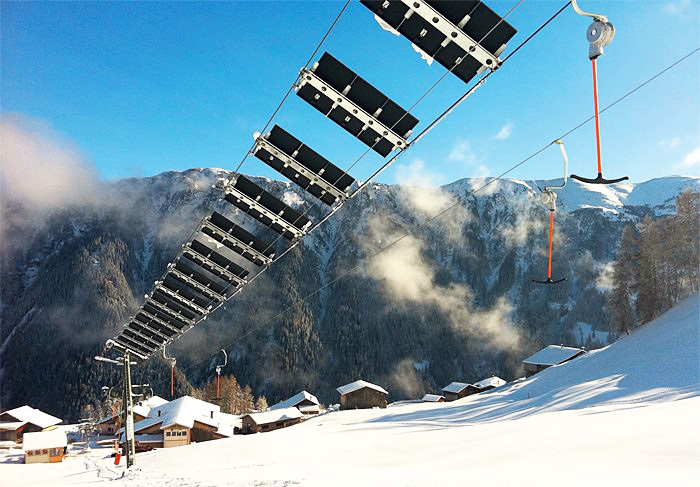 The tiny Swiss ski town of Tenna recently put itself on the map with the world's first solar wing-powered chair lift! 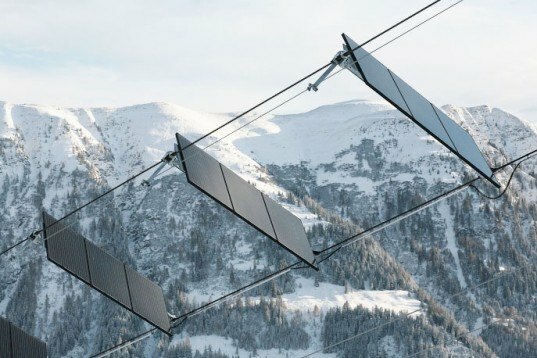 While solar-powered lifts are popping up in ski resorts all over the world, this is the only one with a string of photovoltaic "wings" that float on a string above the lift chairs all the way up the mountain. The little lift is quite popular - it shuttles 800 skiers an hour - and its solar wings dot the white slops with their unique shape, bringing new meaning to the term "black diamond."